We want to thank you for your support in making The Lab 2000, Inc., a leader in the dental laboratory profession. Our dedication to the needs of dentists and their patients is our promise with each case. We provide a perfect product, always on time and the doctor gets to choose what to pay. 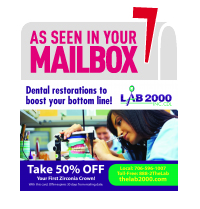 Let The Lab 2000, Inc., help you put a smile on each of your patients’ faces!